There will be a second post for the version where the blocks are set on point, and I’ll link it here when I get the diagrams finished for that. This quilt design uses an EQUAL NUMBER of 5″ Charm Squares and 2.5″ (by width-of-fabric) strips. You will be able to get 1/4 as many blocks as you have Charm Squares/Strips. In the sample above, I used a package of Timeless Treasures Batik Charm Squares and the matching package of strips, and there were 40 of each. I was able to get 10 blocks, plus enough to make a border around the quilt top. The photo above shows ALL of the remaining bits of fabric I had when I finished the quilt top. I used 9 of the 10 blocks in the quilt top, and will either put the 10th block on the back or make a matching pillow cover. 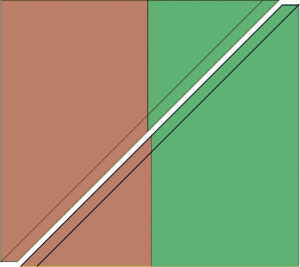 Divide your strips evenly into two piles. If you have doubles of each fabric, separate the pairs. Set one pile of strips aside; these will be used for sashing and borders later. STEP ONE. 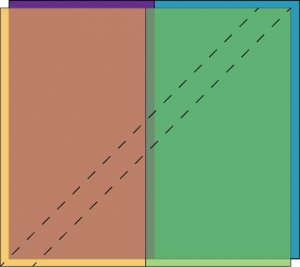 Using a scant 1/4″ seam, sew a 2.5″x5″ piece to the right-hand side of the charm square, and press the seam open or to the side (according to your preference). STEP TWO. Sew a 2.5″ x 7″ piece to the top edge of the previous unit, and press the seam open or to the side. STEP THREE. When you have finished sewing all of your charm squares into the above units, cut them diagonally from corner to corner, as shown. Try to go exactly through the corner where the three fabrics meet, but don’t worry if it’s not totally perfect. You’ll lose any excess in the seam allowance in the next step anyway. You can see below that my diagrams aren’t perfect. One does what one can in a surgical waiting room, and I’m living the “Big Magic” axiom right now: “Done is better than good.” It really and truly will not matter after the next step. I promise. STEP FOUR: Shuffle your sets so that they’re mixed up a bit, and sew them back together. I was careful to orient the triangle halves to always match so that there are one of each type in each pairing so that the charm squares made half-square triangles with each other. Press the seams well according to your preference, and trim the squares to exactly 6.5″. If your seams are too wide, your squares will be too small, so be sure to check your first square to verify your accuracy before you get too far into the process. Yes, you WILL lose some corners where all of the fabrics come together. THIS IS OKAY. More important to the design is the DIAGONAL LINE. There is NO way to protect that corner in this design, because you just cut through it in the last step. It’s OK, I promise you. STEP FIVE: Divide your squares into two piles. Sew a 2.5″ x 6.5″ strip to the right-hand side of one pile of your trimmed squares, as shown below. Press the seam according to your preference. STEP SIX: Being careful to orient the second square properly, sew a remaining square to the right-hand side of each of the units from Step Five, and press the seam according to your preference. STEP EIGHT: From your remaining strips (set aside at the beginning), cut 24 14.5″ pieces. 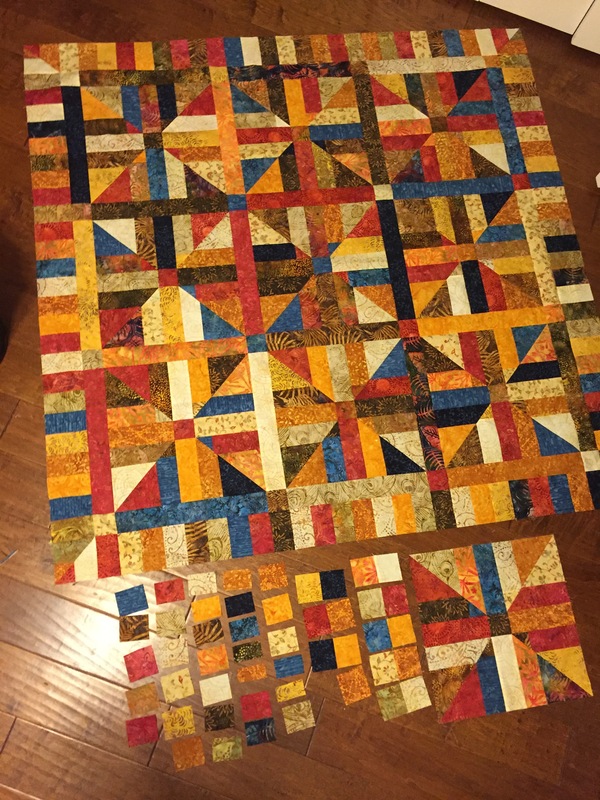 Use 16 of the 2.5″ squares from the first set of strips that you set aside. 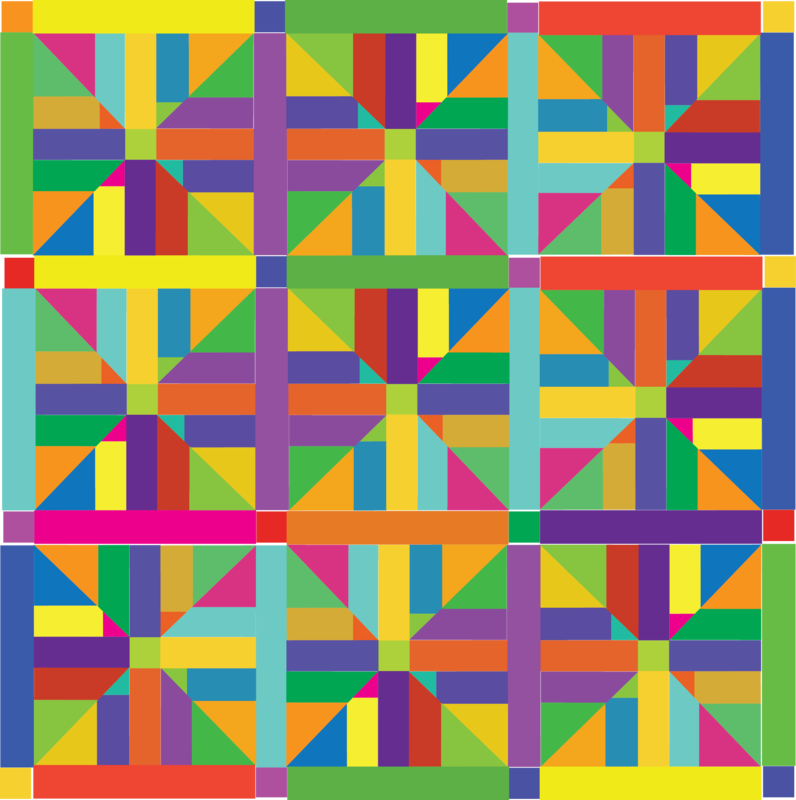 And here is an example of a completed quilt top (again… please disregard the spaces and minor inaccuracies caused by not really knowing what I’m doing in Adobe Illustrator and not taking the time to figure it out while in a surgical waiting room). This will be about 50.5″ wide (unfinished), so you could stop here if you wanted to do so and have a nice little throw! Or you could make BORDERS! STEP NINE: Borders. Cut remaining strips into 4″ bricks. Each edge of the quilt top will need 25 bricks to go from outside cornerstone to outside cornerstone. Assemble 4 25-brick units by sewing them together on their long edges and pressing the seams open or to one side. Sew one each of the 25-brick units to the top and bottom of the quilt, matching up seams as much as possible. Before you attach the sections to the sides, make the corner units. Sew on the sewing lines that you have drawn, and then cut the two sections apart between the sewing lines and press. 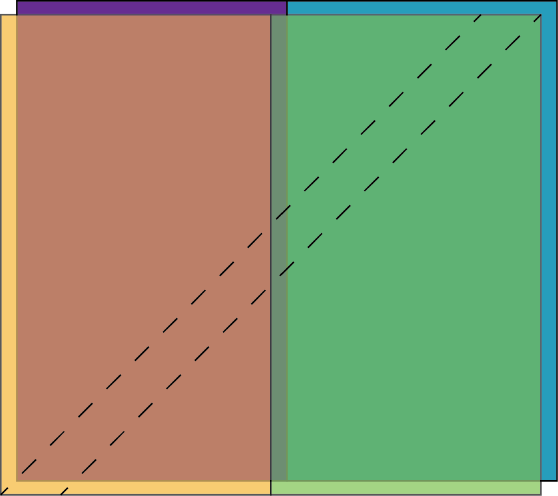 Each set of 4 bricks will yield 2 different corners, as shown below. STEP ELEVEN. 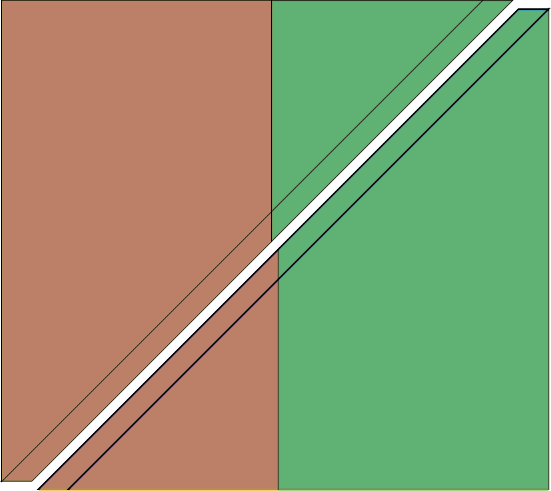 Attach the corners to the remaining two 25-brick border strips, as shown. And then you can attach the remaining two borders to the sides of the quilt top! 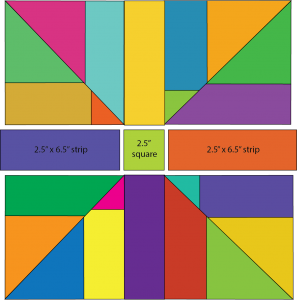 I’m not going to finish out the diagram because I want to get this posted, but here’s the original quilt again in high-contrast batiks so you can see what the final layout looks like and the direction in which to attach the corners. Hopefully I’ll get this one quilted and finished up over the Christmas holidays! Previous Previous post: Coming soon…. Tutorials!